Have a berry merry Christmas when you present friends and family with these exquisite Gourmet Dipped Premium Strawberries this holiday season. These magnificent premium strawberries are a sweet sensation all by themselves, but when they are dipped in luscious chocolate and topped with an abundance of delectable treats, they become simply irresistible. Wonderful unique Christmas gifts for all of your friends, family members and coworkers, these delightful chocolate dipped berries will make a magical addition to your holiday festivities as well this Christmas. 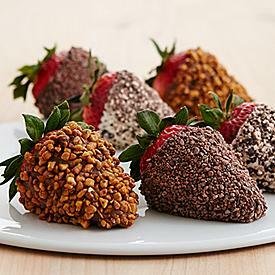 Each order includes a variety of chocolate dipped premium strawberries that are certain to impress everyone on your list. For an even more impressive gift, choose to add chocolate dipped pretzel rods, chocolate dipped cookies, chocolate dipped cherries, or double the strawberries for a treat the whole family can enjoy.